Cloughie's eldest son, Simon, has paid tribute to the people who made the Brian Clough Statue Fund such a success. Following the unveiling of Nottingham's superb bronze statue (November 2008), Simon praised all those involved in the project. He said: "As a family we cannot say enough about those who came up with the idea in the first place and then set about the task of raising so much money for the statue. "Marcus Alton was the instigator of it all and without his idea and persistence the statue fund might never have got off the ground in the first place. His wife Sarah, together with Mick Mellors, Mike Simpson, Rich Fisher, Paul Lowe and the chairman Paul Ellis then set about the task with great enthusiasm and it must be very rewarding for them now to see the project through to its conclusion. "The Council Leader, Jon Collins, has also been very supportive but I would like to thank everyone who has contributed in any way to making it all possible." Simon added: "It is amazing really, but working in Nottingham I do realise on a day-to-day basis how much my Dad meant to so many people. I get stopped by them so often in the street it is a wonder I get any work done! "I know he wasn't everyone's cup of tea, and goodness knows he used to drive me to distraction at times, but there is still enormous warmth and emotion shown to him 15 years after he left Forest and four years after his death. But I can understand it. I'm not a believer in reincarnation, but I still get the feeling that he's going to walk back into my life at some stage. He had that kind of presence that no one forgets." 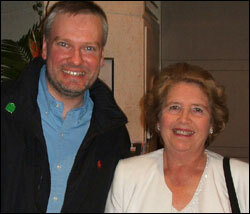 And in a special interview to mark the unveiling of the statue, Barbara Clough described it as a wonderful tribute. "All we can think is how amazed Brian would be at the very idea of a statue," she said. "He would be so touched by it. He used to say 'I hope I contributed and I hope somebody liked me,' and I think a lot of people did. "The Nottingham people just took him to their hearts and they still talk about those days. They loved the football they saw. It was a wonderful time for them all - the European trips. We'll never forget them - they are wonderful memories." 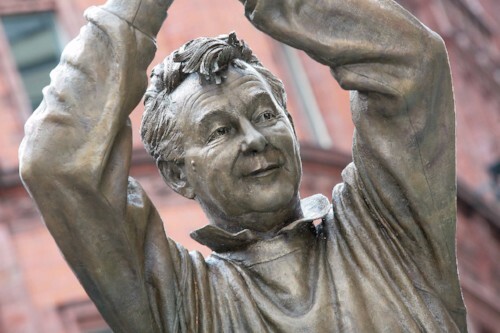 The Brian Clough Statue Fund in Nottingham smashed through its target and raised £70,000. Mrs Clough said it was breathtaking to see the clay sculpture when she visited the studio of sculptor Les Johnson with her daughter Elizabeth. "It was absolutely incredible," she said. "He asked whether there was anything at all we wanted changing and we just looked at each other and said it's perfect."